Be the first to share your favorite memory, photo or story of Mervyn. This memorial page is dedicated for family, friends and future generations to celebrate the life of their loved one. Mervyn D. Rinehart, 86, of Pymatuning Township, passed away following an extended illness, Tuesday morning, January 22, 2019 at his residence. He was born in Freeport, IL on June 28, 1932 to the late Clarence and Pearl (Jacobs) Rinehart. 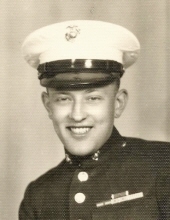 Mervyn grew up in Wisonsin, where he enlisted in the US Marines and served as a Corporal during the Korean War, where he received a Purple Heart. He was a charter member of the Reynolds Veterans of Foreign Wars Post 7599. Mervyn retired from the former Sawhill Tubular (now Wheatland Tube). He was a self taught artist and enjoyed painting. He also enjoyed making model airplanes, hunting, fishing, bowling, and gardening, especially flowers. He loved the companionship of his dogs. Mervyn is survived by his wife at home, Beverly A. (Whalen) Rinehart. They were married on June 29, 1957. Also surviving are: three sons, Richard Rinehart of Sharpsville, Robert Rinehart and his wife, Darlene, of Greenville, and Thomas Rinehart and his wife, Conny, of Warren, OH; several grandchildren and great grandchildren; two brothers, Bruce and Dewick Rinehart; and several nieces and nephews. In addition to his parents, he was preceded in death by a twin sister, Marilyn Sulko. Private services will be held. In lieu of flowers, memorial contributions can be made to: Club Pet Adoption, 20 Schaller Rd., Transfer, PA, 16154 . To send flowers or a remembrance gift to the family of Mervyn D. Rinehart, please visit our Tribute Store. "Email Address" would like to share the life celebration of Mervyn D. Rinehart. Click on the "link" to go to share a favorite memory or leave a condolence message for the family.